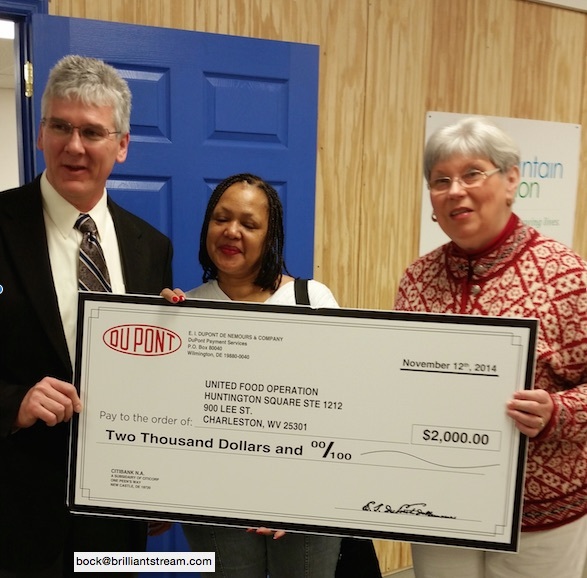 2015 food drive, distributions under way | United Food Operation, Inc.
On January 9, United Food Operation, Inc. (UFO) began its 33rd season of supplying food to 12 community food pantries in Kanawha and Putnam counties of West Virginia. 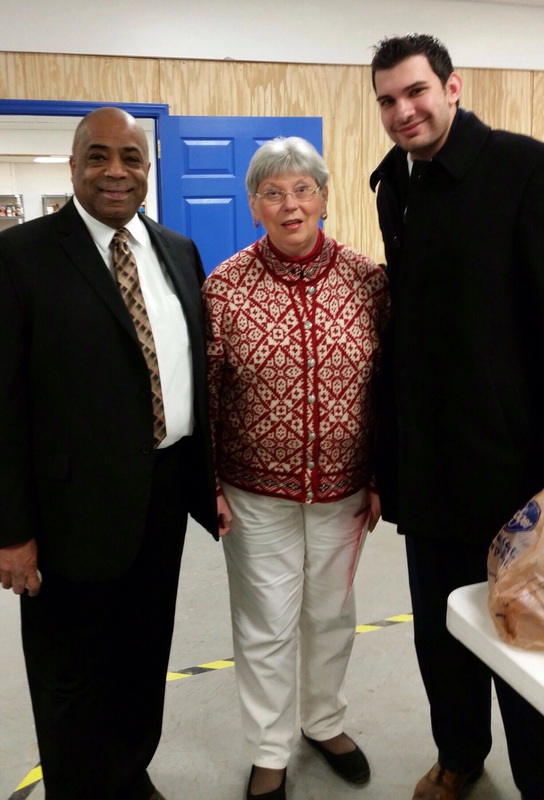 UFO Chairwoman Elaine Harris announced the start of the group’s winter food drive at the kickoff event. 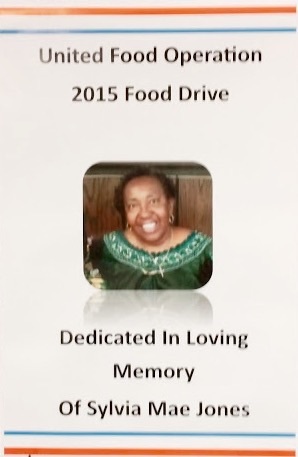 This year’s food drive is dedicated in honor of Sylvia Mae Jones, who was formerly a receptionist at Bayer CropScience and a long-time supporter of UFO. The meeting took place at Charleston’s Mountain Mission, which is one of the food pantries that benefits from the UFO program. Fund raising activity heated up fast as several donations were received from area work systems. Bayer Corp., ICL Group, and Dupont all stepped up to provide significant support for this year’s campaign. 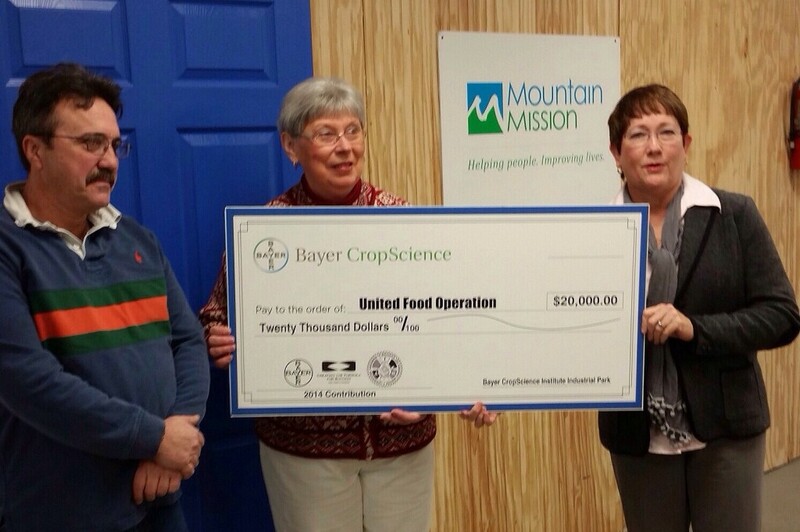 Bayer Corp. makes a much needed donation to support United Food Operation’s 2015 food drive. Pictured are, from left, Cliff Means, UFO Vice Chairman and Bayer CropScience employee; UFO’s Elaine Harris; and Connie Stewart, QSHE Manager, Bayer CropScience, Institute plant. United Food Operation depends on the caring and generosity of workers and companies around the Kanawha Valley to provide the funds needed to fight hunger in the region. UFO is an all volunteer operation, with no salaries, and operates out of donated warehouse space at Institute, WV. 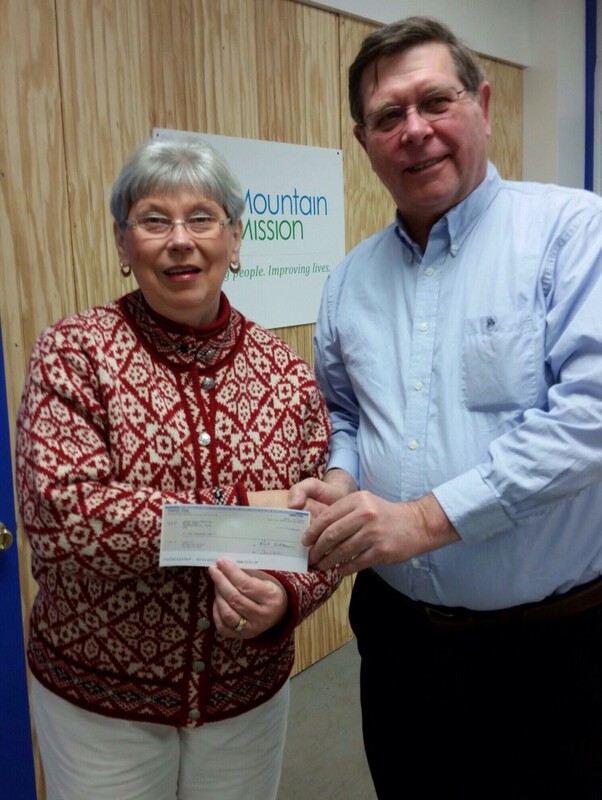 Elaine Harris accepts a generous donation from ICL Group, (formerly known as Clearon) represented by John Kadlec, Director of Operations, South Charleston plant. Because UFO operates with almost no overhead, all the funds it raises in the annual food drive can go toward purchasing food, which it then supplies to the community food pantries free of charge. Dupont shows its unity with the UFO 2015 campaign by making a welcomed donation of funds. Pictured from left to right are Jim O’Connor, plant manager, Dupont Belle Works; Pam Valentine, UFO volunteer and DuPont retiree; and UFO’s Elaine Harris. 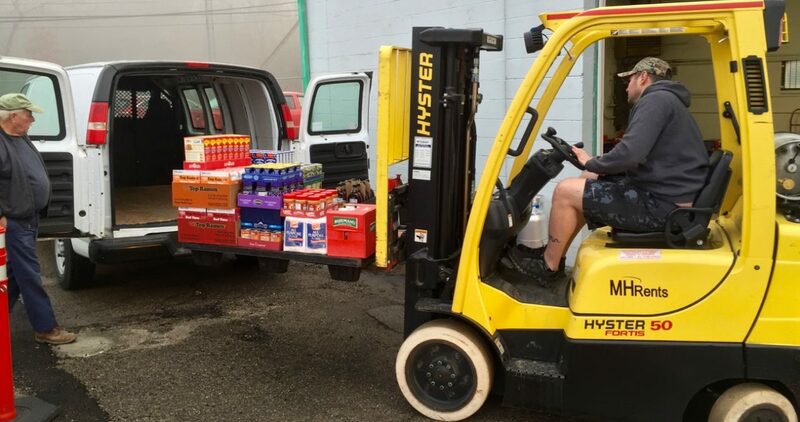 Each Saturday from January through March, food pantry vehicles arrive at the UFO warehouse located in the Institute Industrial Park, to pick up a free load of packaged foods. This food is a big help to the pantries that are often strapped to meet the large need they find in their communities. State Senator Chris Walters (at right) attended the program kickoff to show his support for the efforts of food pantries to feed the hungry. Also pictured are UFO’s Joseph Davenport and Elaine Harris. United Food Operation receives support from a variety of employers and individuals around Kanawha and Putnam counties. Elaine Harris emphasized that more support is needed this season in order for the group to meets its goals. Business or individuals wishing to help can contact Harris at 304-342-2023.